The Iowa trip ended up being the "trip of superlatives." I guess when you have miles of flat land, it's irresistible to put up some kind of large creation. 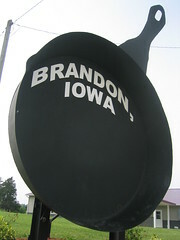 Brandon, Iowa is the home of Iowa's Largest Frying Pan. 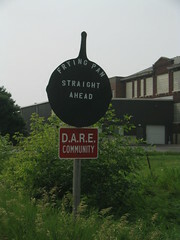 No, they don't make any claims to be the World's Largest Frying Pan, they're satisfied to keep it local. It's easy to find due to the great signage and small town. The pan itself is surrounded by nice landscaping and is a perfect photo op. It was built to promote the semi-annual Cowboy breakfast hosted in Brandon. It has an 8-foot base and 5-foot handle and weighs 1,020 pounds. It has the capacity to hold 44 dozen eggs, 352 pork chops, or 88 pounds of bacon! After snapping our pictures, we hurried down the street to the Kwik Stop where "Largest Frying Pan Souvenirs" were advertised and picked up some bumper stickers.